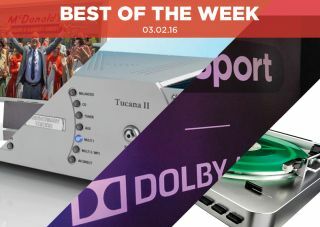 Best of the Week: BT Sport in Dolby Atmos, Bryston CD player, Audio Technica budget turntable and more | What Hi-Fi? This week, a Canadian company has come up with a way of manufacturing vinyl at a faster rate, Bryston unleashed its BCD-3 CD player and Sky (eventually) signed a deal with Discovery to keep the latter's channels on its service. Elsewhere, we have plenty of reviews with Philips' excellent 24PFS5231 TV, Leema's updated Tucana II Anniversary Editon amp and Audio Technica's budget AT-LP60-USB turntable. And we have a report on the first TV broadcast of Dolby Atmos sound, courtesy of BT Sport. A new method of vinyl production that could produce records at a faster rate is being tested in Canada. Current means of production are so far behind the times that artists sometimes have to wait for up to a year to get recordings out on vinyl. Viryl Technologies has created a new pressing technique called WarmTone. The company hopes to have six machines running at the same, which could produce 24,000 records in just one day. Announced just before Christmas, the Bryston BCD-3 CD player has gone on sale via distributor PMC. Aimed at the audiophile market, the BCD-3 has a wealth of high-grade features inside including the award-winning BDA-3 DAC. Bryston claims it will be able to play CDs without any jitter. The CD player is priced at £3700. Earlier this week, Discovery threatened to pull its channels from Sky over a dispute about cost. The spat was successfuly resolved at the eleventh hour, with a new deal that will keep Discovery's portfolio of 12 channels (including Eurosport) on the Sky platform "for years to come". Excellent news for those viewers who enjoy Shark Week. "The Philips 24PFS5231 is a compelling, and rare, find"
It's well known that, by their very nature, flatscreen TVs don't tend to have the best sound. So any attempt to beef up that so often tinny output is welcome. Philips has gone down the route of attaching a speaker to the bottom of the screen - and it works wonders. The set doesn't sound thin and manages to produce a satisfying amount of detail, dynamics and volume. Add in the Philips' very capable picture and this is an excellent, affordable TV. "While the Tucana’s price has steadily gone up over the years, so has its performance"
The Tucana first came out more than 10 years ago, and to celebrate Leema has released an Anniversary Edition. Apart from the new badge and reworked logo, not much has changed externally. It's under the cover where things get exciting. With lots of power, strong dynamics and the same terrific build and finish, the Tucana II Anniversary can play all types of music with equal skill. An excellent amp. We've had plenty of budget record decks come through our test rooms, but the Audio Technica is one of the better ones. It offers a clear, balanced and articulate sound, though it could, perhaps, use a little more solidity. It's also very accessible and allows for records to be ripped digitally. If you're looking for a decent, cheap deck, this is as good as any.